who else went wack for the pack back in the day? I remember them damn things! They looked different than that though...maybe I'm remembering the original ones...am I that f*cking old? How very MAD Mag they look! I don't remember them. I had them all...yeesh, I am truly old. 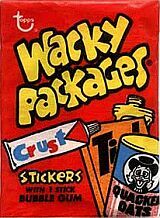 What was up with that cardboard gum ? Region is younger than me.....and FLAUNTING it. Was the bubble gum really stinky? Not even nine year old boys are gross enough to chew stinky gum, are they?? You know, this post explains a whole lot...stuff I have been, you know, kinda wondering about.......odd stuff about Region. So...what did the worms taste like? I remember the cards from back in the 60s that caused quite a stir. The neighborhood parents asked the little store to stop selling the gum cards because the kids were so crazy for them. Now it's driving me nuts to figure out what they were called. My formative years?......it HAD to be A&BC Civil War Cards. A big slab of bubble gum, and several gory pictures. I remember those, Boom, they had a whole series of really grotesque cards. I got suckered into buying some which supposedly were about the American civil war--but, for example, they had a card about the C.S.S. Alabama, which showed the ship sinking in flames in the background (wrong, wrong, wrong) and showed screaming sailors in the foreground being attacked and eaten by sharks. One showed Lee reviewing his troops, who were missing arms, or legs, or eyes . . . they were truly bloody and grotesque. I think they had other series than just that civil war thing, and they focused on blood and gore . . . There ya go, what Ellpus said . . .
My favourite was the one with the spiked wheels being rolled down onto the soldiers below. ......oh, and Jamboree bags, but I think that was just a Brit thing. Sherbet lemons (you could buzz those across the playground and they made a cloud of "smoke" on impact). Those little plastic rockets that had a small spring bolt at the tip. Put a couple of capgun caps into it, throw it into a crowd of skipping girls and wait for the bang....great fun!